During the decades of feverish Westernization and modernization which followed the Meiji Restoration of 1868, there were many who believed that the traditional form of Japanese poetry then called the HOKKU, but now known as the HAIKU, would disappear as a LIVING ART FORM. How wrong these people were. Not only does HAIKU-making (let alone the enjoyment of reading existing poems) still thrive in Japan, but it has become one the THINGS JAPANESE which has gone international in a big way, with people discussing, writing and publishing them in numerous countries (and languages) around the globe. What makes a HAIKU a HAIKU ? Well, besides consisting of only 17 syllables broken up into 3 phrases of five, seven and five syllables each, the poem should also contain a season-indicating keyword called a KIGO. 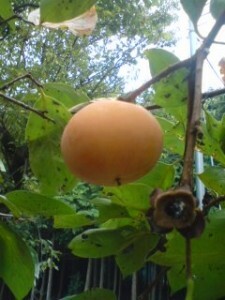 Though these are often connected to natural phenomena such as- cherry blossoms (spring), cicadas (summer), the moon (autumn), and frost (winter), these keywords can also be foods, customs, or events which have come to be associated with certain times of the year- spinach(spring), ice cream (summer), rice harvest (autumn), Christmas (winter). I guess it could be said that because it involves a continual, day to day consciouness of season and an awareness of how human life and the surrounding environment are in constant flux (though working in annual cycles), the HAIKU is the QUINTESSENTIAL JAPANESE ART FORM and getting involved in it can be one of the best ways of becoming deeply acquainted with this country`s customs, foods, nature, lifestyle, etc. 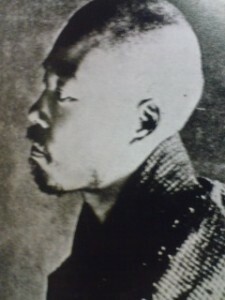 It is interesting for me that some of Japan`s great poets, those who have so skillfully and sublimely used KIGO to evoke various facts and feelings connected to certain times of the year, HAVE BECOME KIGO THEMSELVES, with their memorial days (anniversary of death) being used as seasonal indicators. This is done by putting the character KI (忌) after the poets name.Last year I was thinking of writing an article about the SHIKI-KI (子規忌), the memorial day for Masaoka Shiki (1867-1902), which is September 19th, but somehow I never got around around to it. I said to myself that I would HAVE TO write something about this man on his next memorial day.Why? Well, it is not only because he is considered one of the FOUR GIANTS OF THE HAIKU (along with BASHO, BUSON, and ISSA) or that he could be said to be the man who saved the haiku from decline and possible obscurity( it is he who, in fact, popularized the term HAIKU, itself). I feel a special connection to SHIKI because his writings have had a MAJOR IMPACT on my own life and on the content of this blog. By this I am NOT referring specifically to his poems, but rather to his essays and other writings which became familiar to me through a book (MASAOKA SHIKI) written by long term Tsukuba resident and Shiki specialist Janine Beichman. It was a passage such as this, starting on the bottom of page 45 of her book, which affected me-Shiki also wrote that the beginning poet should constantly take walks and travel all over, in every season. The subjects of his poems need not be restricted to famous places, however; if one looked about calmly and carefully,subjects could be found everywhere. Even in a little garden, where one could take no more than ten steps, the poet might find a new subject everyday (Janine Beichman). And though I am no poet, I have taken this attitude close to heart, and because of this, over the years, I have developed a deep attachment to Tsukuba and its nature. It is this sense of WONDER that I have been trying to convey to the readers of Tsukublog.Another thing that makes me feel an affinity with SHIKI is our shared love of BASEBALL. It seems that it was he who gave this sport its Japanese name YAKYU (野球), literally FIELD BALL, and also created many of the special baseball terms which are used in Japanese today- CHOKYU (直球)- fastball, DASHA (打者)- batter, and SOHSHA (走者)- runner. SHIKI was actually inducted into the Japanese Baseball Hall of Fame in 2002, and often when I am in Ueno Park in Tokyo, I take a break between visits to exhibitions and watch a game at the baseball field there, which is named after the poet. Here is a poem (tanka) of SHIKI`s which expresses our shared feelings about the game:HISAKATA NO AMERIKABITO NO HAJIME NI SHI BESUBORU WA MIREDO AKANUKAMO (久方の アメリカ人の はじめにし ベースボールは 見れど飽かぬかも)Far away, under the skies of America, they began baseball-AH, I could watch it forever (translation- Janine Beichman). For the general Japanese public , however, mentioning the name of Masaoka Shiki will bring to mind one (HAIKU) poem in particular (because it is in the standard school curiculum) about eating a persimon at the venerable old temple HORYUJI. It goes-KAKI KUEBA KANE GA NARU NARI ( As I CRUNCH into a persimon at the old Temple, its bells RESOUNDS – my translation). It is because of this strong connection between persimons (KAKI), baseball, and Masaoka Shiki that I was actually was able to jot down these scribblings in time for this year`s SHIKI-KI. You see, being as busy as I am and always having so many things on my mind at any paticular time, I had lost track of the fact that Shiki`s memorial day was coming up again( though, I had a subconscious awareness, of course). So it happens that early in the morning today (the 19th), I had an appointment to play STICKBALL, a kind of one on one, New York City version of baseball, and started out of my house , walking towards the City Office, where we have our field. Turning a corner, I stepped on something which made a CRUNCH. I looked down. Persimons! There were more on the branches overhead.The first time I had noticed them this season! 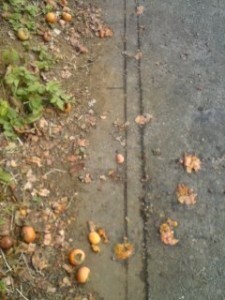 With baseball bat in hand and these fruit above and underfoot , I immediately remembered SHIKI ! An excited check of my cell phone calendar confirmed that it WAS in fact the day I had been planning to write about- SHIKI`s memorial day. On the way to my game I thought up this English HAIKU -Off to play baseball, I step on a persimon- CRUNCH, it’s Shikiki (Shiki’s Memorial Day)! Due to Lack of Rain When Needed Most, Tsukuba`s Rice Harvest 2018 is Less Than Great – but still good! HIGANBANA – 彼岸花 ( SPIDER LILIES) are AMAZING Flowers- but never give them as gifts in Japan! Thank you for this wonderful article on Shiki and all the mentions of my book. I am very happy to know that the Tsukuba City Library has it. The newest (2002) edition, with photos, etc. is available on amazon.jp. It’s exciting to know that Shiki’s ideas on observing nature had influenced you so much. And I love your own haiku too. We always read your articles with interest and admiration!